We offer ad-hoc workshops, short fill in sessions and workplace education pathways. All of these services can be tailored so your organisation gets what it really needs, we don’t believe in one size fits all. Our leading education products are the Value, Flow, Quality (VFQ) pathways. These are all multi-week programs which are designed to build a wide range of skills needed within a specific area. An on the job approach delivers hands on learning where education is combined with day-to-day improvements in the workplace. 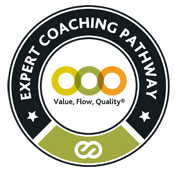 The VFQ Expert Coaching Pathway, has been designed to create a lasting legacy within your organisation. By covering a wide and deep look at topics across the entire agile and lean arena, by the end of the pathway you will have gained a team of internal coaches. 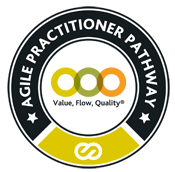 Capable of supporting your transformation and leading others through the Agile Practitioner Pathway. The VFQ Agile Practitioner Pathway (APP), you will grow your people’s skills and capabilities in a sustainable way. Covering a broad range of topics, from addressing the value in the business, delivering early and often, through teams, adapting agile and agile practises of Scrum and Kanban. At the end of the pathway, students can options undertake the British Computer Society (BCS) Practitioner Certificate in Agile. This eight-week VFQ Product Management Action-Learning Course will help you learn and apply the skills to enable you to create products that your customers will love.We all know that there’s no shortage of good ideas out there, but there is a shortage of the skills and capabilities required to bring a product to life. The Value, Flow, Quality pathways are our most popular education offerings, however we also offer the following single topic training classes, all of which can be delivered onsite. If needed they can be also tailored if something specific is needed. Either run as a half or full day introductory session to the concepts and values of agile practises. Suitable for a broad range of audiences spanning IT and non-IT alike, from your senior team to practitioners. Focuses on the role of the Product Owner within an agile environment. Covering topics from creating a vision for your product or service, building awareness of your customers, the importance of communication, building a prioritised backlog to how to work with delivery teams. Contact us today for details about what we can do for your business. Enter your email address to subscribe and receive notifications on new posts and information.